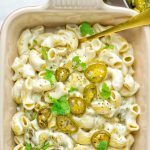 This Jalapeno Mac and Cheese is the easiest make ahead meal ever and comes with a homemade, naturally vegan cheese sauce. You can prepare it in only 15 minutes and have a delicious lunch or dinner for the whole family ready. I’ll show you how to make it from simple ingredients on the stove or as a baked mac and cheese version in the oven. If you prefer it milder, just swap jalapenos for green chili (Anaheim chili). So simple! First, cook your pasta according the directions. At the same time heat a bit oil or vegetable broth. Add garlic and sliced jalapenos and roast them for about 3 minutes until they are lightly browned. Set aside. When the pasta is done, pour the water off and return the drained pasta back to the stove. Mix with prepared 3 Ingredient Vegan Cheese Sauce (just blend cashews, vegetable broth, and tahini), roasted jalapenos and garlic, nutritional yeast, and vegan cream cheese. Season with salt and pepper to taste. Only step left to do is warming everything for 5 minutes on medium heat. Divide on bowls or plates.